Autophagy is an intracellular degradation mechanism essential for cell survival and maintenance of cellular homeostasis, differentiation and development. Recent research has highlighted the impact of autophagy in neurodegenerative diseases and aging. We are still far from fully understanding the molecular mechanism of autophagy and its regulation, which is essential for the use of autophagy as a therapeutic target. Our laboratories use different model systems to study autophagy. 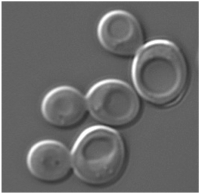 These models include the yeast Saccharomyces cerevisiae, the social amoeba Dictyostelium discoideum and mammalian cells in culture. Our multidisciplinary approach allow a deep level of analysis of the proteins involved in the mechanism of autophagy with an emphasis in those related to human disease.